Today, we remember our veterans and show our immense gratitude for their sacrifices. Thank you so much for all that you do for us and for our country! Nearly 100 years ago, on the 11th hour of the 11th day of the 11th month of 1918, an armistice was signed between Germany and the Allied Nations, ending World War I. From then on, November 11 was known as Armistice Day. Then, in 1954, the holiday was changed from Armistice Day to Veterans' Day. On this day every year, we thank those who have served the USA. This fictional tale, based on a real event during WWI, takes place on Christmas Eve 1914. The war had started several months prior, but on this night, the war paused. The Allied armies could hear the German army singing "Stille Nacht, heilige Nacht" from across the frozen No Man's Land. The Allied forces soon joined in with "Silent night, holy night." This event unofficially became known as the Christmas Truce. 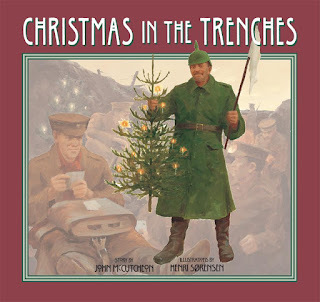 Author John McCutcheon originally wrote a song based on this event called "Christmas in the Trenches." He said, "I first thought I would only sing the song and tell the story during the Christmas season. I soon learned that it deserves--no, needs--to be told 365 days a year." 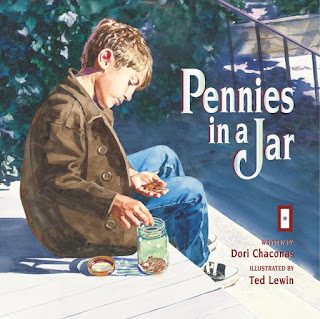 This beautiful story tells the tale of a young boy whose father goes off to fight in WWII. Before he leaves, his father tells him, "If something is important enough, you just have to do it, even if you are afraid." The boys makes sure to follow his dad's words of wisdom while he is away. Thank you veterans for doing the job you do, even when you are afraid.